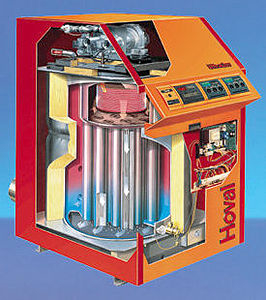 Initial operation of these units is similar to ordinary boilers. A fuel is burned to heat water, which then circulates through a system of pipes and radiators for space heating. However, condensing boilers use their flue gases and condensation of the water vapor therein to preheat the cooled return water before another heating cycle. This can produce energy savings of up to 30%. Choice will depend on capacity, intended use (space heating, hot water) and installation type (wall-mounted, freestanding). Another factor is fuel type. Gas is the most common, but some burn oil or wood pellets. These last are less expensive and more ecological, but require storage space and regular restocking. Gas and oil are easier to use, but are more expensive and polluting.